Friday is Arbor Day 2018, and Arbor Day is always a great reason to consider urban forestry issues. Many communities do tree planting and other events in association with it. 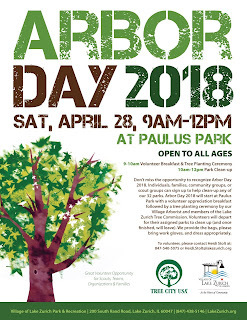 For example, Lake Zurich, Illinois leverages the event for volunteer engagement and clean ups at the city's 32 public parks. I thought this infographic, 52 types of wood and the trees they come from, showing both the tree and the type of finished wood that comes from them was interesting because most of us don't know. Trees are a fundamental element of a community's "natural" environment and landscape. With regard to streets and tree cover, I've been influenced by park planner David Barth's recommendation in a presentation I saw many years ago that cities should treat streets as "linear parks." 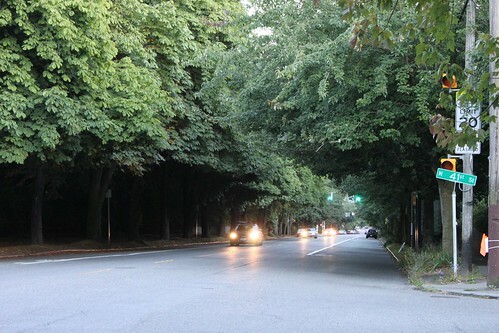 This thick tree canopy on Fremont Avenue North in Seattle gives the impression that the street is more park like. Recently, I picked up an old book (published in 1999) about Frederick Law Olmsted, A Clearing in the Distance, by Witold Rybczynski, which I've started reading. Olmsted was the founder of modern parks planning in the U.S. 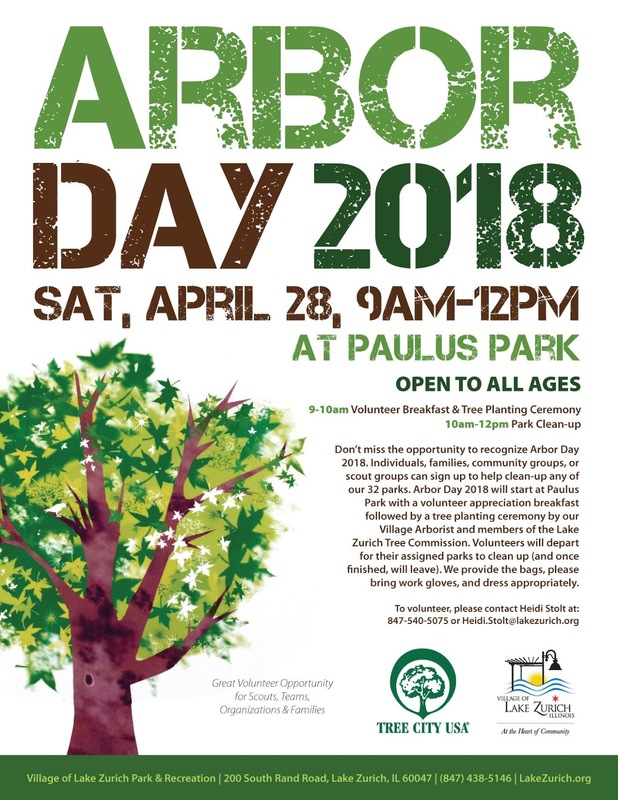 The Tree City USA program of the National Arbor Day Foundation is the most widely known of programs that promote sound practices by local jurisdictions. Washington DC is one of the many thousands of communities that have been designated by the program. Thinking bigger: Cities as "municipal arboretums." Most cities manage street trees via a forestry department that can be located in a variety of different agencies--public works, transportation, utilities, or parks. Many cities and counties have regulations concerning maintenance and care of trees on public and private property. But they still think about trees more individually rather than as a part of a larger forest. Under the ArbNet program, the Morton Arboretum in Illinois has developed an arboretum accreditation program for communities. It aims for the consideration and operation of a community's urban forest as a unit, an open "municipal arboretum." Cities that are so accredited are Basalt, CO., Bexley, OH, Oak Park, IL. and Newport, RI ("Bexley could be first U.S. city to be declared arboretum;" Columbus Dispatch). Community forests/forest districts. Illinois has parks districts, such as the Chicago Parks District. It also has "forest preserve districts" that are set up like parks districts to preserve and manage community forests. According to the history webpage of the Forest Preserve District of Cook County, the idea behind the district was to conserve natural landscapes during a period of rapid change. Like parks, these days forest preserves grapple with providing programs that attract new audiences. For example, one forest preserve in Cook County is adding zip lines, in association with a Maryland-based company ("Zip lines coming to Cook County forest preserve," Chicago Tribune). In an article a few years ago, Chicago Tribune architecture writer opined that "Cook County Forest Preserve District has room to improve," but he is pleased with the trajectory of improvements after many years of the agency being treated as a backwater by the County Government. Community forests are important to an area’s quality of life, they are part of the “urban ecosystem.” Imagine what your neighborhood would be like if there weren’t any trees in it. 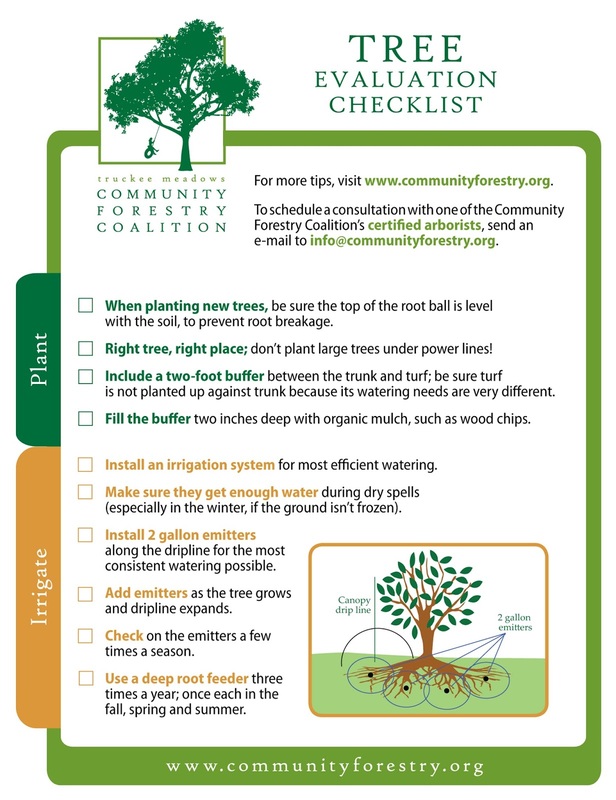 A healthy community forest is an important part of the environmental and economic vitality of cities and towns across the country. In the Truckee Meadows, our community forest does not occur naturally as it does in the Sierra Nevada or the Pacific Northwest. Much of Nevada is a dry, high-desert ecosystem where few trees grow on their own. Our community forest depends on people planting, caring for, and watering their trees. Sustaining the health and vigor of our region’s tree canopy is the combined responsibility of residents, business owners, nurseries, landscapers, and governments! The majority of the community forest in the Truckee Meadows is growing in on private lands: in the front and back yards of homes and in common areas managed by homeowner’s associations. We also have trees growing in parking lots, next to shops, businesses and malls, and around our offices and industrial areas. Our public trees are found in parks, along our streets, and lining the Truckee River. This part of the community forest is primarily managed by our municipal governments (Washoe County and the cities of Reno and Sparks), however, residents may care for some of these trees as well. The cities and county require trees and other vegetation be incorporated into new development projects in our community. Economic value of trees/urban forest. There are many reports on the economic value of trees, of both a direct and indirect nature such as this one. Studies have found that commercial districts with a quality tree canopy are more successful than those without one ("City Trees and Property Values," Arborist News, 2007). The National Tree Benefit Calculator provides data on the economic value of individual trees in terms of storm water, property value, energy savings, air quality, and carbon dioxide capture. 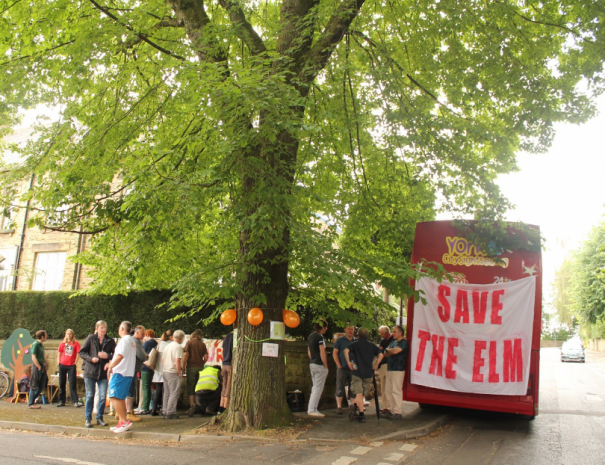 Save the Elm action by the Sheffield Tree Action Groups. Trees as an expensive element in maintaining public space. Unfortunately, because trees can be "expensive" to maintain, bean counters can see trees merely as a hindrance, especially when the environmental benefits aren't taken into consideration. With that perspective it can be seemingly cheaper to cut trees down. 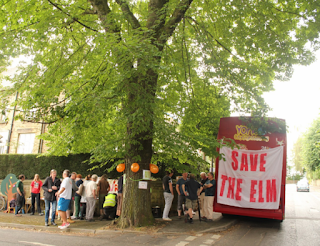 This is a problem in Sheffield, England, where the city signed an outsourcing contract for street maintenance with no opportunity for public input concerning the disposition of trees. The contractor has been aggressively cutting down trees ("Put a price on urban trees – and halt this chainsaw massacre," Guardian). Watershed maintenance and the potential for wildfire. Some cities out west are beginning to fund broader watershed maintenance as a way to reduce the risk of water source contamination from wildfire. Although there are teething problems with the concept when it comes to implementation. Flagstaff, Arizona is one of a few jurisdictions to look at management of the potential for wildfires as an element of watershed and water quality management. In 2012, they passed a bond issue to pay for mitigation. It was particularly noteworthy because much of the watershed lies outside of the city borders. Santa Fe does this too ("Got water? Thank (and save) a forest," Santa Fe New Mexican). But 8 years later, $10 million turns out to not be enough, even though other property owners are matching this with funds of their own ("Flagstaff watershed protection reason to celebrate," Arizona Daily Sun). And complications working with other public landowners, especially the US Forest Service, add cost and time to the execution of the plan as well. Plus just because they thin the forests doesn't always mean there's a profitable market for the lumber or sawmills to process it.